Got one of this to track my sleep. It was triggered by a dinner with several very successful ex-colleagues who all claimed that they don’t need much sleep nowadays, like 5 hours a day is enough. So I started wondering how come I still need minimum 8 hours and ideally 10 hours of sleep a day? 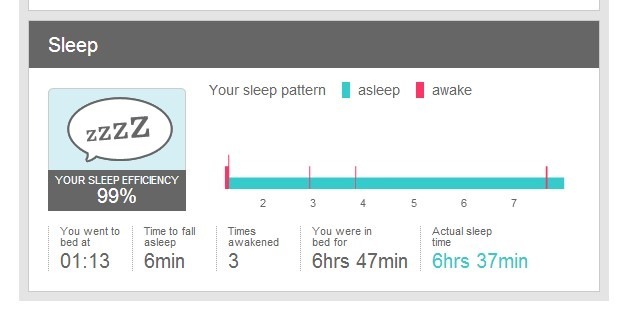 Can it be the problem of my sleep quality? And the answer is a clearly no. Not only did I not toss around while sleeping, but actually I did not move at all except for the toilet breaks. I guess I simply need that long hours of sleep, just like a baby. Having said that, also it was quite fun. For sure I am not going to carry something constantly sending wireless/bluetooth signals. Nowadays I even turn my mobile phone to airplane mode and keep it far away while going to bed. I simply don’t want my brain fried by those wireless signals as shown in that Danish wifi beansprout experiment! Fitbit® One™ I Wireless Activity & Sleep Tracker – Advanced tracking for daily activity, sleep, and stairs climbed.